Contemporary government buildings have a reputation for functional ugliness. But in 1909, when the newly consolidated city of New York needed more office space, city officials seemed to realize that a forward-thinking metropolis should have triumphant architecture. So they commissioned the McKim, Mead, and White–designed Manhattan Municipal Building at One Centre Street, which was completed in 1914. 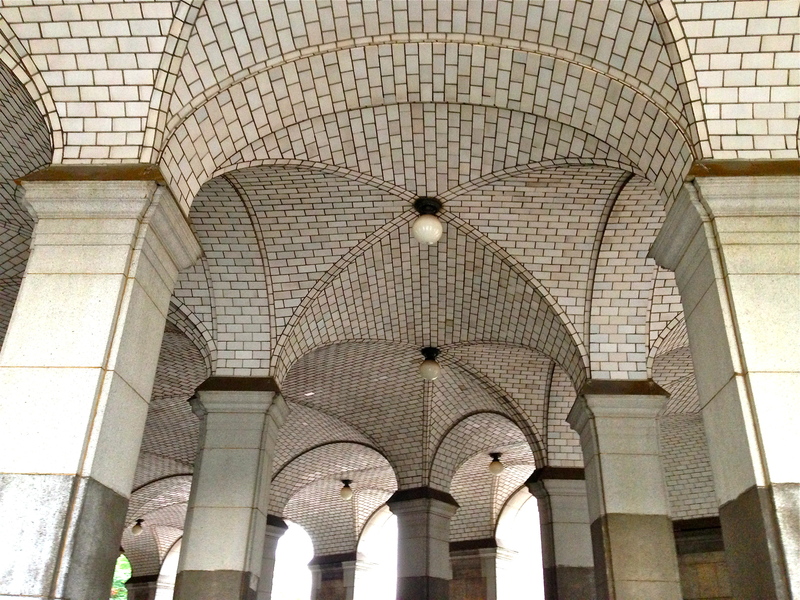 One of the building’s loveliest features is outside: the vaulted ceiling at the south arcade. 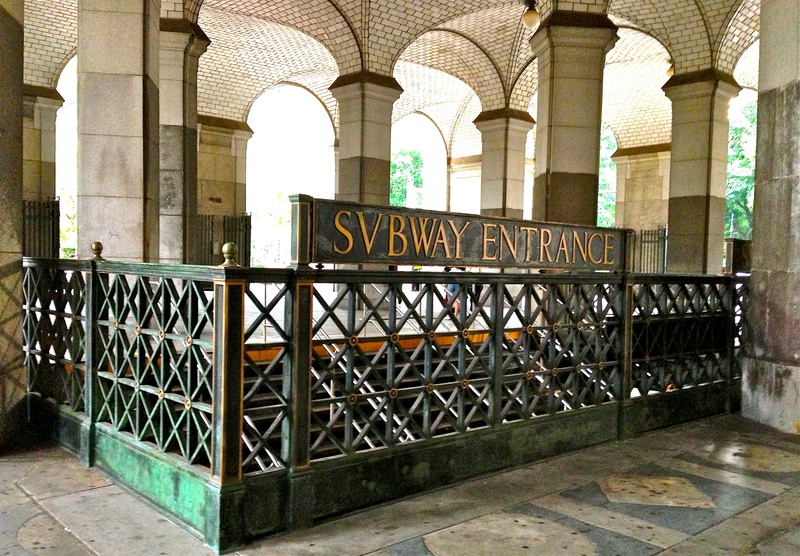 Here, surrounding the entrance to the Brooklyn Bridge-Chambers Street subway station, are beautiful columns and white Gustavino ceiling tiles. Look up at them for a brief moment, and you might imagine yourself at an Italian palazzo rather than in Lower Manhattan. 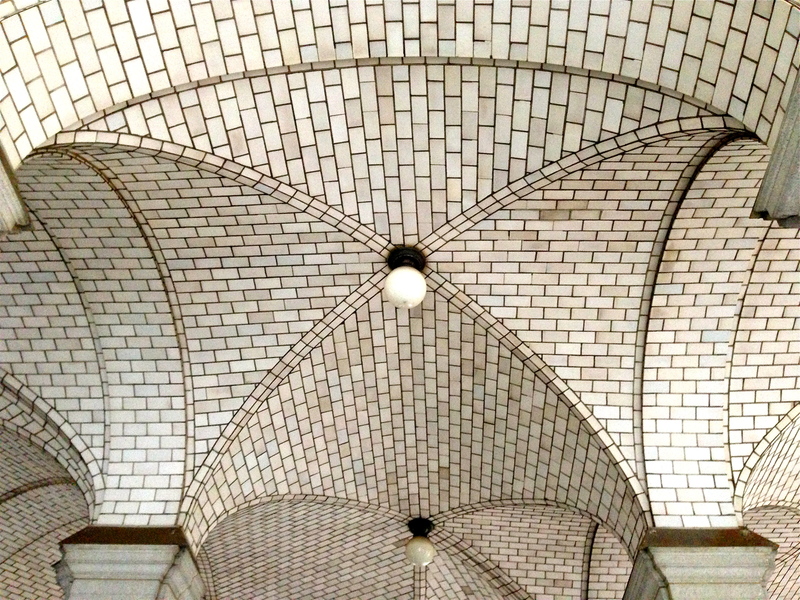 The vaulted ceilings are a reminder of the Gustavino-tiled ceilings of the long-shuttered City Hall subway station, all glorious curves and colors and light. This entry was posted on August 12, 2013 at 5:32 am and is filed under Cool building names, Lower Manhattan, Music, art, theater, Transit. You can follow any responses to this entry through the RSS 2.0 feed. You can leave a response, or trackback from your own site. This ceiling just might be the only enjoyable part of serving jury duty in NYC. yes! And the video with Diane Sawyer, do they still show that? I was on jury duty last week at 111 Centre Street and, yes, they still show that Diane Sawyer/Ed Bradley video. It is SO dated! Guastavino also did the Tennis House in Prospect Park, unfortunately it is behind a fence now, but you can still get close enough to see it well. I was married here, stood up for my brother’s wedding here, and while I was waiting, stood up for a stranger’s wedding as well. I wonder if they’re still together…. thanks for the memories, Eph! You’re welcome! I was the witness at my sister’s wedding here. Very sweet experience. Beautiful. The Food Emporium under the 59th St Bridge has a similar ceiling. Does anyone know what the space was originally used for? Ephemeral New York is wonderful; thank you for sharing these snippets of history. Thank you! I’m curious about the 59th Street ceiling as well, if anyone knows.